Imagine if we had no knees. Moving around will be difficult and our legs will feel very unstable. The knee plays a major role in our regular daily activities and is also the largest joint in the body. However, the knee can also be injured. A sprained knee is when there is an injury to the surrounding ligaments of the knee joint. To fully understand the knee joint and how it can get injured, we need to understand what makes up the knee. It is a hinge joint in the body found between the thigh and leg. It is made up of bones, ligaments, menisci and muscles. This is the largest bone in the body. The femur has 3 components; the head, the body and the lower part. The lower part of the femur has two articulating surfaces known as the medial and lateral condyles. It is the second largest bone of the body. The upper part of the tibia also has a medial and lateral condyle that fit in with the condyles of the lower part of the femur to form the tibiofemoral joint. The tibiofemoral joint is also known as the weight bearing part of the knee joint. It covers and protects the tibiofemoral joint. This bone is located beside the tibia bone. Most of the muscles in the thigh and at the knee attach to the fibula to allow movement of the knee joint. These bones are joined to each other to form the knee joint by tough fibrous connective tissues called ligaments. This ligament joins the femoral bone to the tibia bone anteriorly. It has two bundles; the anteromedial bundle and the posterolateral bundle. These bundles are so named because of the where the bundles attach on the tibial bone. The anterior cruciate ligament resists the tibia from sliding forward when we bend and extend our knee joint. A tear to the ACL is one of the most common injuries of the knee joint. The PCL connects the femur to the tibia posteriorly. Just like the ACL, the PCL also has two bundles; the anterolateral bundle and the posteromedial bundle. The PCL is thicker and stronger than the ACL and is not as frequently injured, unlike the ACL. The PCL resists the tibia from sliding backward when we move the knee joint. It forms an “X” with the cruciate ligament at the center of the knee. The LCL connects the femur to the fibular bone. It is found on the lateral aspect of the knee. It is also known as the fibular collateral ligament. It stabilizes the lateral aspect of the knee and prevents the knee from going out laterally. The MCL is also known as the tibial collateral ligament. It is found on the medial aspect of the knee. It stabilizes the medial part of the knee and prevents the knee from going inwards. What Can Cause A Sprained Knee? This is when there is an external force to the knee joint. This can be during a car accident or during a sporting activity. An example is when two players are playing soccer and one player uses his knee to hit the other player’s knee. This can lead to a ligament sprain. Imagine wearing heels and walking down the stairs. You miss a step and in the process of stabilizing yourself, you twist your knee in an awkward manner and fall. This can lead to a ligament sprain because the knee was not made to twist. Muscles should be prepared for any activity. This is why a warm-up is necessary. Not warming up properly puts the knee joint at a risk of a sprain. If the muscles are not well prepared, it puts a lot of stress on the bones and ligaments. Wearing inappropriate shoes causes a lot of weight bearing at the knee joint because the feet are not well balanced. Continuous wearing of wrong shoes puts the knee at risk of getting unstable and causing ligament sprain. This is a deformity in which the knees curve outwards which causes an overstretching of the LCL. This makes the knee unstable and makes the overstretched ligament susceptible to a sprain. This is a deformity in which the knees move inwards which overstretches the MCL. This is a deformity in which the leg tends to go backward or an excessive extension. This overstretches the PCL. This is a mild ligamentous injury. The ligaments overstretch but they do not tear. The knee may not swell so much but there will be a mild pain. This is a moderate ligamentous injury. Some ligaments partially tear. This causes swelling and a lot of pain. This is a severe ligamentous injury. The ligaments tear completely. This causes swelling, pain, and bleeding under the skin. How Can You Be Sure That It Is A Sprain? The pain usually starts immediately or a few minutes after. The pain may feel like a throb. Once a ligament is injured, there is an inflammation process that takes place. When there’s an injury to a ligament, the knee becomes unstable. The knee can no longer bear the body weight and in the process, it tends to shift out of its initial position. For example, a sprained LCL can cause the femur or tibia to shift laterally which is not meant to happen. This is when there is bleeding under the skin after a ligamentous injury. If you feel pain just by touching the affected area, that means it is tender. Sometimes, torn ligaments can cause nerve compression and may make you feel tingling sensations down your feet. Due to pain and swelling, it will be quite difficult to move the knee. Due to no movement, the knee can get stiff. 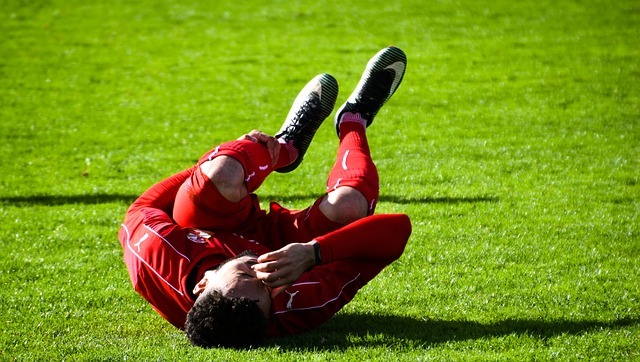 How Is A Knee Sprain Treated? The mistake most of us make when there is a knee injury is that we move or massage it immediately. You should not move an injured joint until a doctor or physiotherapist has assessed it. Doctors may most likely prescribe anti-inflammatory drugs for a sprained knee. 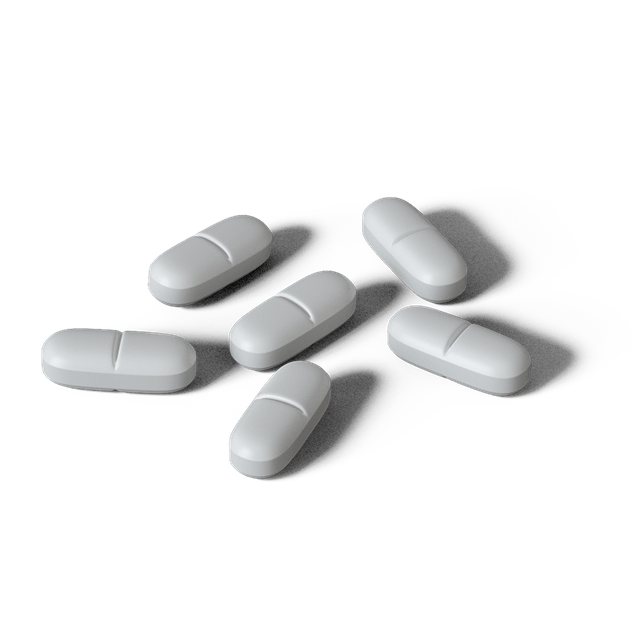 Since one of the symptoms is swelling, the anti-inflammatory drugs assist in reducing the swelling internally and also help reduce pain in the knee. The injured knee should be protected. A knee brace or a Kinesio tape will protect the knee from further injury, which can occur by moving the knee joint. It is advised not to bear weight on an injured knee. Rest basically means, “let the knee be”. Crutches are usually recommended to avoid weight bearing on the injured knee. Rest allows the natural healing process to take place. Ice reduces swelling and also relieves pain. Place an ice pack for 15 – 20 minutes on the affected site or crush ice in a damp towel for 15 – 20 minutes every 4 hours. Ice should be placed in a towel in order to avoid frostbites. Compression helps to reduce swelling. A crepe or elastic bandage can be wrapped around the knee joint. The bandage should not be too tight but firm. Raise the affected limb using pillows above heart level. Elevation reduces swelling. 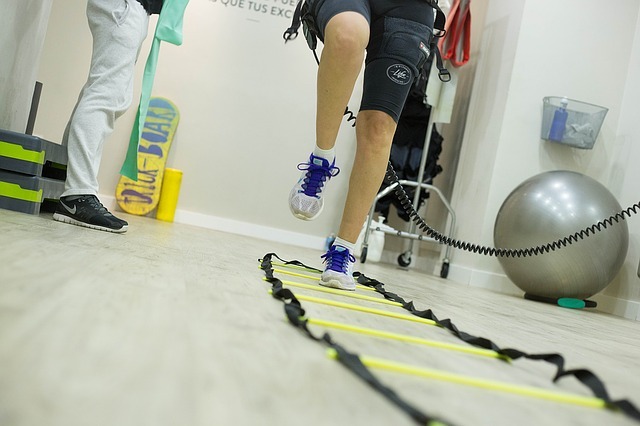 A physiotherapist will assess the knee joint and start an exercise regimen depending on the severity of the injury. A physiotherapist will also recommend strengthening the unaffected leg, as the leg will be carrying all the body weight. Do not do exercises without seeing a physiotherapist as some exercises can cause more harm than good. Move your ankle by pointing your toes downwards and upwards. This can be repeated 1o times. This strengthens the calf muscles and there is no movement at the knee joint while doing this. Place a rolled up towel or a pillow under your thigh. Tell someone to pull the towel or pillow from under your thigh. your job here is to ensure that the person assisting you can not pull it from under your thigh. basically, you use your thigh to hold down the towel or pillow. this causes a contraction in your quadriceps muscle which helps to stabilize the knee joint. How Can You Prevent Knee Strains? Gradually build up your exercises if you have had a previous strain to strengthen the muscles around the affected joint. Strong muscles will support the ligament injured.